The postie arrived today with a large box from Renadra that I didn’t remember ordering. 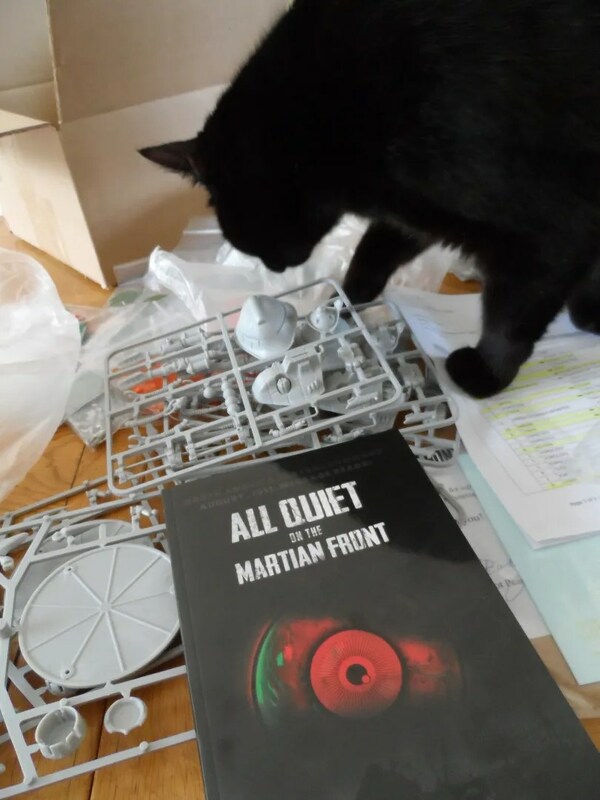 Turns out its the “All Quiet on the Martian Front” kickstarter stuff that I subscribed to 12-18 months ago. A great big pile of plastic kits and some metal infantry. I’d assumed it’d all be coming from the rebel colonies – looks like they took advantage of UK plastic manufacturers. But the Martians have a few new devices up their, err, tentacles ! So a major battle is happening in North America. Byakhee Rich conned me into this new shiney stuff. I rationalised that as it was 15-18mm scale I could use some or all of it for my existing Laserburn stuff. I’ve long been into H.G.Wells’ War of the Worlds, having listened to Jeff Wayne’s musical that my father had borrowed from a work colleague when I was about seven. Unloading the box, not all of the kick starter components are in there, but that is not a problem, what is there is highlighted on the shipping note. And as you can see BlackJack is diligently checking the contents. The other positives of this, is that they have designed it to be used with HO/OO scale buildings and scenery, and as my father is a railway modeller I grew up with many such buildings, in particular the SuperQuick buildings. This would make the scenery cheap and cheerful – as scenery boy I could nothing other than provide the scenery ! My initial response is very positive. The kits and figures are very well produced. The cut down rule book looks really well produced and an initial read through makes sense. D10s are used throughout – a growing trend in wargames I note as we break free of the old d6 paradigm. The Kits need detailed build instructions. That’s a slip up by Alien Dungeon. 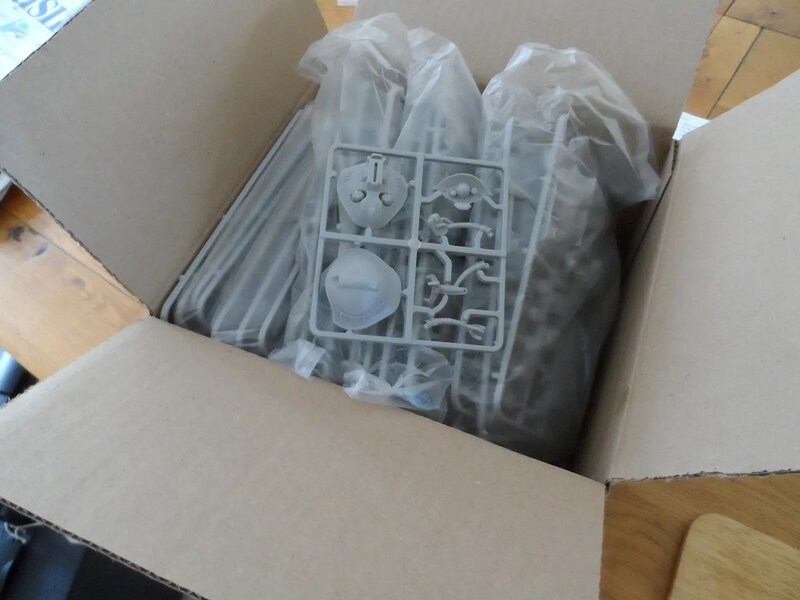 A pile of plastic sprues is great, and many can be put together with intuition by experienced modellers. It would have been much more helpful to have had instructions though. Many such exist in particular on their own forums such as here. Right I’m now off to listen to somemusic and start to build some kits !